The Kasta Tomb (Greek: Τύμβος Καστά), also known as the Amphipolis Tomb (Greek: Τάφος της Αμφίπολης), is an ancient Macedonian tomb that was discovered inside the Kasta mound (or tumulus) near Amphipolis, Central Macedonia, in northern Greece in 2012 and first entered in August 2014. The first excavations at the mound in 1964 led to exposure of the perimeter wall, and further excavations in the 1970s uncovered many other ancient remains. The recently discovered tomb is dated to the last quarter of the 4th century B.C. The tumulus is the largest ever discovered in Greece and by comparison dwarfs that supposedly of Philip II of Macedon, father of Alexander the Great, in Vergina. The excavation team, based on findings unearthed at the site, argued that the tomb was a memorial dedicated to the close friend of Alexander the Great, Hephaestion. It is not yet known who is buried in the tomb. Initial public speculation that it could be the tomb of Alexander the Great, due to its size and the estimated cost of construction, was dismissed by experts when commenting on the published findings, as the available historical records mention Alexandria in Egypt as the final resting place of Alexander the Great's body; it has been suggested instead that the occupant could either be a wealthy Macedonian noble or a late member of the Macedonian royal family. In November 2014, the skeletal remains of five people were unearthed inside a corresponding tomb located in the lower levels of the third chamber. The bodies interred within are those of a woman aged older than 60, two men aged between 35–45, a newborn infant, and a fifth person consisting of only a few cremated bone fragments. Further examination is underway with regard to dating the bodies, while a DNA cross examination is being conducted in order to compare them with those buried in neighboring tombs in the area. During a press conference at the Aristotle University of Thessaloniki, lead archaeologist Katerina Peristeri and head architect Michalis Lefantzis revealed the existence of three inscriptions which apparently link the tomb to Hephaestion, a Macedonian nobleman, general and close friend of Alexander the Great. The ancient Greek word "ΠΑΡΕΛΑΒΟΝ" (meaning "received") is written in the inscriptions, and next to it the monogram of Hephaestion. In the 1970s a building of 10 m (33 ft) width was found on top of the centre of the mound, and is thought to have been a grave marker. This, together with other evidence, supported the likelihood of a large funerary complex within. The tumulus was also found to have covered earlier cemeteries with at least 70 graves from the nearby "Hill 133" settlement predating Amphipolis. Two marble sphinxes approximately 2 m (7 ft) tall that guard the main entrance to the tomb (one head and wing fragments later found in third chamber). A fresco, paint still visible, that mimics an Ionian peristyle, on top of which the sphinxes sit. Two female statues of the Caryatid type in the antechamber, which support the entrance to the second compartment of the tomb. The height of each Caryatid is 2.27 m (7.4 ft). The Caryatids are on a pedestal 1.40 m (4.6 ft) tall, making the total height of the statues 3.67 m (12.0 ft). A marble door, typical of Macedonian tomb doors, broken into pieces in front of the doorway to the third chamber. The head of the eastern sphinx in the third and last chamber. Fragments of the wings of the sphinxes in the third chamber. An eight square metre vault and a marble door in the third chamber. Seven architraves were found in the 2nd Chamber, and restoration is under development. The younger male showed signs of unhealed, possibly fatal wounds. Analysis of the skeletal remains is ongoing. In response to the magnitude of the finds, the authorities of Central Macedonia have requested and were granted a heavy 24-hour police guard of the dig site, and have also begun procedures to have the Kasta Tomb included in UNESCO's list of World Heritage Sites as a "top priority". In November 2017, the Greek Minister of Culture, Lydia Koniordou, announced that the grave should be accessible to the public in about three years. The financing for the necessary construction project should amount to around €2.8 million. €1.5 million is to be spent by the Region of Central Macedonia, €1.3 million is to be taken from the INTERREG Fund of the European Union. In the course of this measure, building materials of the grave site, which were later used by the Romans elsewhere, will be rebuilt in their original location. The work should begin in 2018 or 2019 and last for around one year. The Lion of Amphipolis, an 8 meter tall statue dating from the same period and according to excavation team was originally located on the top of the tumulus (30-9-2015, Aristotle University of Thessaloniki). The imposing size of the lion in an early picture of a plaster cast used for restoration of the original. Kasta tumulus in Amphipolis, Macedonia. The tomb is also shown in scale. Tomb position is only indicative. The head of the excavations, Katerina Peristeri, during the official presentation of the findings. 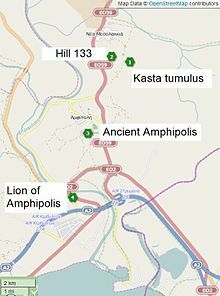 The board game Amphipolis, designed by Reiner Knizia, was published in 2015 and it is based on the location and findings of the Kasta Tomb. ^ a b c "Συνέχιση ανασκαφικών εργασιών στον Τύμβο Καστά στην Αμφίπολη". www.yppo.gr. Ministry of Culture and Sport. 20 August 2014. Retrieved 10 September 2014. ^ a b c d Andrew Marszal (7 September 2014). "Marble female figurines unearthed in vast Alexander the Great-era Greek tomb". www.telegraph.co.uk. The Daily Telegraph. Retrieved 10 September 2014. ^ a b Kate Müser (9 September 2014). "Greece's largest ancient tomb: Amphipolis". www.dw.de. Deutsche Welle. Retrieved 10 September 2014. ^ "Πέντε οι σκελετοί στην Αμφίπολη: 3 άντρες, 1 γυναίκα και 1 νεογέννητο" [Five skeletons in Amphipolis: 3 men, 1 woman and 1 newborn] (in Greek). The Huffington Post. 19 January 2015. Retrieved 25 September 2017. ^ "Συνέχιση ανασκαφικών εργασιών στον Τύμβο Καστά στην Αμφίπολη". www.yppo.gr. Ministry of Culture and Sport. 21 August 2014. Retrieved 10 September 2014. ^ "Συνέχιση ανασκαφικών εργασιών στην Αμφίπολη". www.yppo.gr. Ministry of Culture and Sport. 24 August 2014. Retrieved 10 September 2014. ^ "Συνέχιση ανασκαφικών εργασιών στον Τύμβο Καστά στην Αμφίπολη". www.yppo.gr. Ministry of Culture and Sport. 7 September 2014. Retrieved 10 September 2014. ^ "Συνέχιση ανασκαφικών εργασιών στον Τύμβο Καστά στην Αμφίπολη". www.yppo.gr. Ministry of Culture and Sport. 21 September 2014. Retrieved 12 October 2014. ^ "Συνέχιση ανασκαφικών εργασιών στον Τύμβο Καστά στην Αμφίπολη". www.yppo.gr. Ministry of Culture and Sport. 21 September 2014. Retrieved 30 September 2014. ^ "Συνέχιση ανασκαφικών εργασιών στον Τύμβο Καστά στην Αμφίπολη". www.yppo.gr. Ministry of Culture and Sport. 2 October 2014. Retrieved 13 October 2014. ^ "Greece archaeologists uncover Amphipolis floor mosaic". www.bbc.com. BBC. 12 October 2014. Retrieved 12 October 2014. ^ "Amphipolis tomb: Archeologists reveal figure of Persephone in mosaic – The discovery also suggests that the bearded man is the god Pluto, ruler of the underworld". www.tovima.gr. TO BHMA. 16 October 2014. Retrieved 17 October 2014. ^ "One of the sphinxes' heads found at Kasta". www.newstomb.gr. newstomb. 22 October 2014. Retrieved 24 October 2014. ^ "Amphipolis: Sphinxes's wings discovered; Video from inside the tomb released". Keep Talking Greece. 28 October 2014. Retrieved 28 October 2014. ^ "Eight Square Meter Vault and Marble Door Found in Amphipolis Tomb". 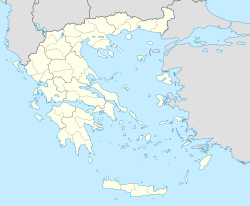 greece.greekreporter.com. Greek Reporter. 31 October 2014. Retrieved 31 October 2014. ^ "Seven architraves were found in the 2nd Chamber". Facebook. 31 October 2014. Retrieved 31 October 2014. ^ "Αμφίπολη: Προς ένταξη στα μνημεία της UNESCO – Εντυπωσιακό βίντεο από ελικόπτερο". www.euronews.com. Euronews. 3 September 2014. Retrieved 10 September 2014. ^ "Amphipolis | Board Game | The Dice Tower | The Dice Tower". www.dicetower.com. Retrieved 2016-03-24. ^ "Who will save Amphipolis?, Sakis Ioannidis | Kathimerini". www.ekathimerini.com. Retrieved 2016-03-24.